you could just as easily serve it as a side dish alongside roast meat, poultry or even a meaty fish like swordfish. will add a stronger more cabbage flavor, so probably best to omit them on your first attempt. 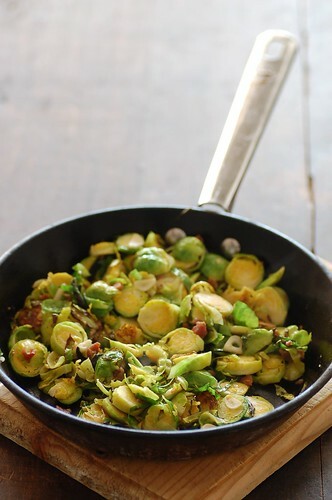 Take the trimmed sprouts and finely slice lengthwise into 4 or 5 slices. Heat a small frying pan over a medium heat. Add oil and allow to warm for a few seconds before adding the pancetta. or until the sprouts are starting to soften and take on a golden color. Season well and pile onto a plate. Preheat the oven to 175°. In a 25cm skillet, heat 2Tbs of oil over medium heat. Add leeks and 2 tablespoons water; season with salt and pepper. Cook, stirring occasionally, until they begin to brown, about 10 minutes. Add sherry and sage and cook until liquid is reduced to a glaze, about 3 minutes; set aside. In a shallow baking dish, arrange pupkin in overlapping layers; season with salt and pepper. Spread leeks evenly over the pumpkin. Arrange apples in an overlapping layer over the leeks. Brush apples with remaining tablespoon oil. Cover tightly with aluminum foil. Bake 45 minutes. Uncover and sprinkle cheese over the top. Raise the oven temperature to 450 degrees and bake 10 minutes, or until the cheese has melted and is golden brown. The tip of a paring knife should easily pierce the gratin. Let cool 10 minutes before serving. Garnish with sage leaves.